As we near the end of our fiscal year on September 30, we're turning to you to help us raise an additional $20,000 to end the year strong and reach even more fathers and families next year. Lewis Kostiner could tell you from experience about the difference that National Fatherhood Initiative’s (NFI) work has made in the lives of dads and families. As a professional photographer, Mr. Kostiner traveled around the country at his own expense to meet dads who participated in NFI’s fathering programs through their local communities. Mr. Kostiner’s photographs and the stories of these families are collected in an inspiring book, Choosing Fatherhood: America’s Second Chance. Jonathan Coughlin is one of those dads. A husband and father of five children, Jonathan serves in the United States Army and has experienced the challenges of being deployed away from his family in a war zone. He participated in National Fatherhood Initiative’s programs for military dads. NFI partners with military installations in all branches to help families prepare for deployment and equip dads to stay connected with their children. It was hard to imagine that, just a few miles from this serene picnic pond next to the U.S. Army base at Fort Riley, troops were training rigorously before they were sent off to fight in Iraq and Afghanistan. They were all members of the 1st Army Brigade. It was a strangely quiet and removed landscape. Jonathan Coughlin’s family was what I always imagined the perfect American family to be: three boys and two girls and a loving mother. Jonathan […] lit up whenever [his children] ran in and out of my picture field. He would kindly let them know that they needed to behave. They boys grew restless as the twin girls took it all in. Rarely would a photographer be given the gift of photographing a family such as this. You could tell that, with Jonathan and his wife in their lives, these kids were going to do well. Jonathan was also a father to the soldiers under his command. He lamented to me that, in many ways, they had to come first, sometimes above his own family. His job was to train his troops well and keep them alive. He was so proud of them. They, too, were his children. When I left Fort Riley, I was so proud to be an American and happy I had a chance to meet and photograph Jonathan and his family. Jonathan and the military dads that he leads are real-life dads who have found the support they need to balance their commitments to the nation and their families through NFI’s programs. 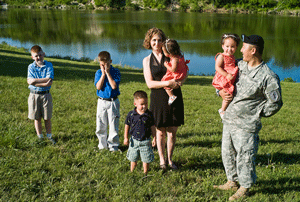 By supporting NFI, you are giving a second chance to military families like the Coughlins. Will you help us reach more families next year?